After a fun five days and nights we dropped off Lisa’s brother Jerry and his wife Arlene at the train station. It was time to put the petal to the metal, and start covering some real distance. I’m talking about moving Rabelo over thirty kilometers a day, or around twenty miles. I know what you’re thinking. Well, no matter how slow Rabelo is, she’s faster than any hotel you have ever stayed in. We needed to be outside of Paris heading for Champagne before Lisa’s niece, and her family join us in a few weeks. It was going to take some long days on the canal to keep our schedule. Even though we would be running the boat for ten hours a day there would always be beautiful things to see. Of course the minute you’re in a rush something has to break. Fortunately it wasn’t Rabelo. In fact lately our big girl has been behaving herself. 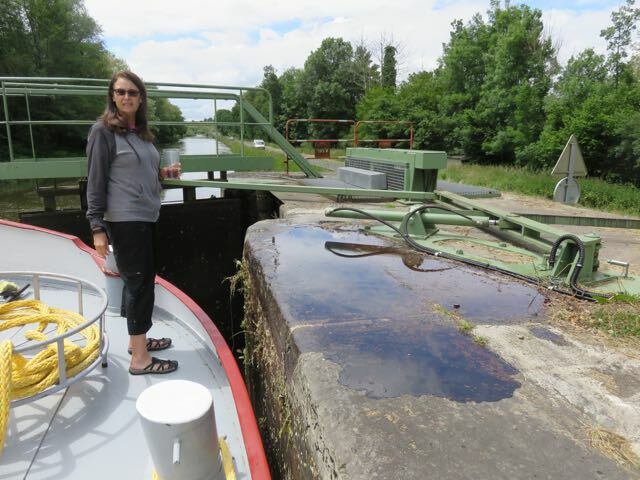 We entered a lock, and waited calmly for the water to drain out. 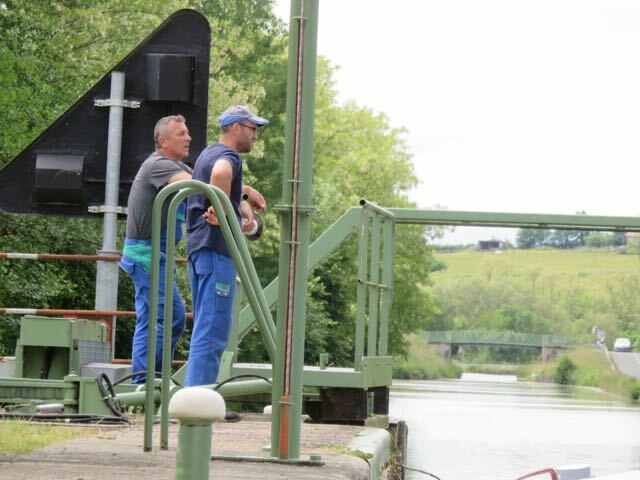 When it was time to leave one of the lines feeding a hydraulic ram that operated a lock gate sprang a leak. Kevin immediately called the VNF to come fix it. I figured we would be stuck there at least a couple of days. Two VNF guys showed up in fifteen minutes. They examined the problem, and then removed the pins that connected the broken hydraulic ram to the gate. They then opened the broken gate manually, and with in ten minutes were on our way. Thank you VNF! Lisa inspecting the broken hydraulic ram, and the hydraulic fluid that had leaked out. The VNF workmen that saved the day. I was amazed that the VNF workmen did not seemed disturbed about all the hydraulic oil that had spilled into the canal. Normally if this had happened with a private vessel the clean up would have cost hundreds of thousands of Euros. Oh well, that’s barging. 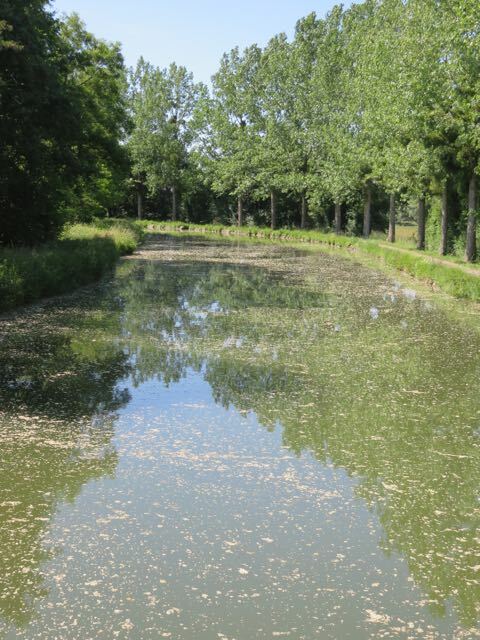 We left the winding Canal du Centre and were now on the Canal Lateral a la Loire, which is in the Charolais region of France. 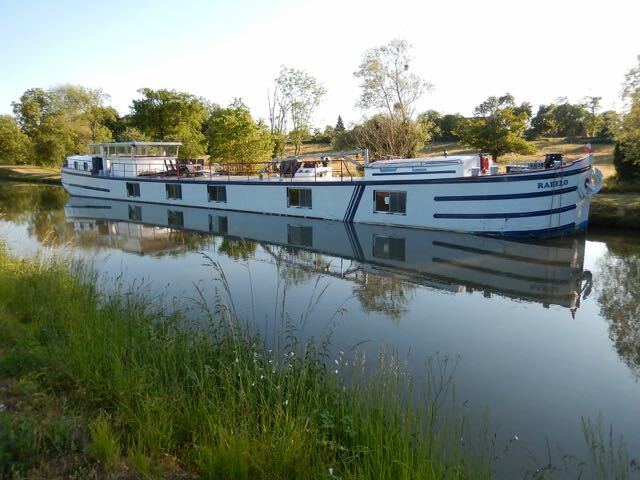 Because the canal is in the Loire River Valley, and follows the Loire River there are not many locks compared to most canals. Some of the locks are as much as ten kilometers apart. When you’re trying to cover some distance that’s important. We normally figure around fifteen minutes per lock, though if everything goes perfect we can do a lock in under ten minutes. 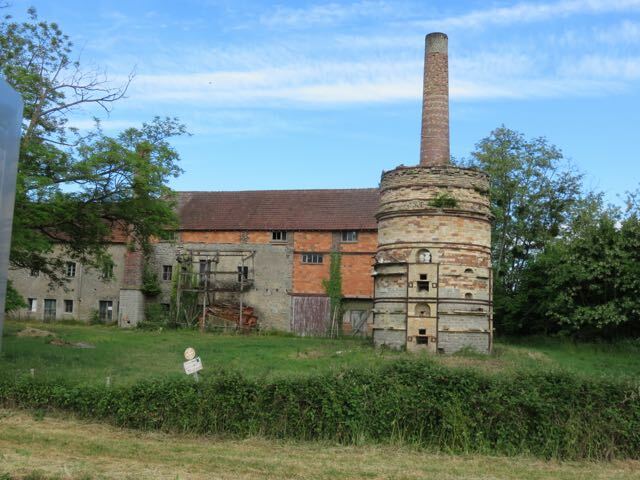 An old pottery factory along the canal. 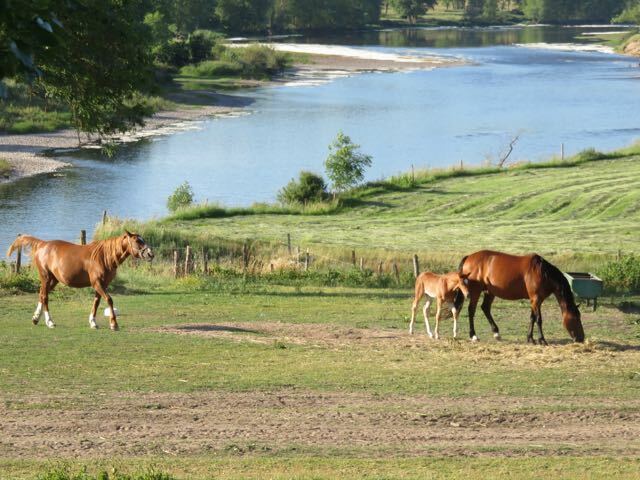 A family of horses alongside the Loire River. A quiet place for Rabelo to tie up. 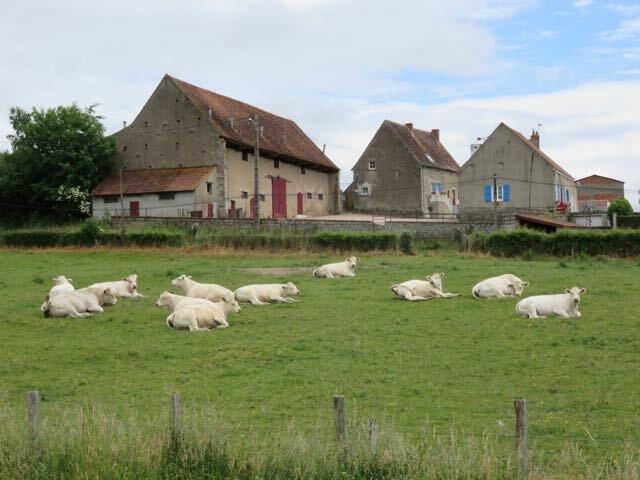 Because we were in the Charolais Region there would be plenty of the famous French Charolais cows along the way. The area was also famous for its pottery. So far as we were concerned even more important were its wild cherries. We would also be crossing the Loire River and its many tributaries on elevated aqueducts. 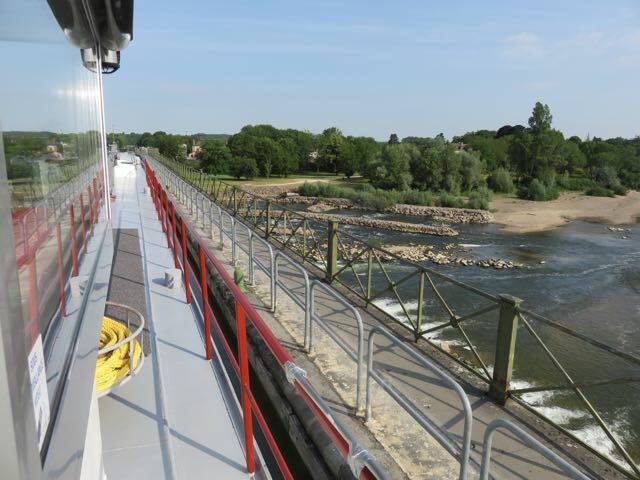 Crossing the Loire River on an elevated aqueduct. The canal covered in flower petals form the Acacia trees. 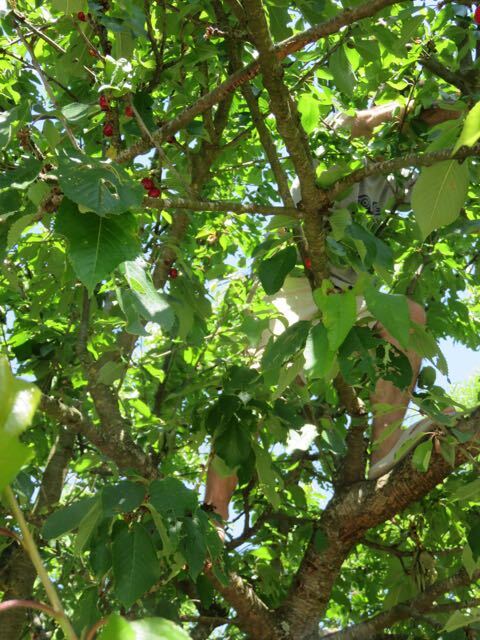 Kevin picking wild cherries next to a lock. We kept up our ten-hour days for three days straight, and then I made a momentous decision. I said, “Screw it.” We were here to have fun. Running the boat every day for so long was stupid. Kevin and I sat down with a chart and completely changed our itinerary. We will now meet Lisa’s niece and her family around Montargis, which is about three long days, or a week of normal days, from the Seine River. 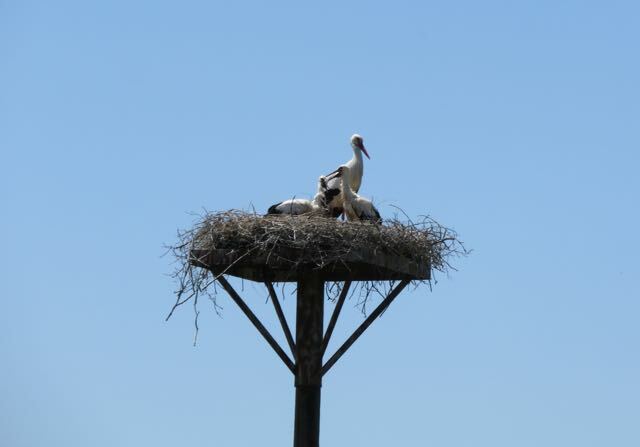 Fortunately no matter where you go in France there are always plenty of things to do and see.